To reach the site for the school we travelled north from Gulu to Parabongo and on the way witnessed a massive highway construction project being funded and built by the Chinese. This new road will connect northern Uganda and the border crossing into South Sudan, bringing with it both opportunities for the farmers to get their produce to new markets and threats that their land will become increasingly desirable to help feed the growing demand from China. Once in the north of Uganda we visited many schools but they were all built to the same colonial design, resembling pre-war barracks blocks with mud brick or blockwork walls, large, poorly shaded windows and single skin, wriggly tin roofs. Inside, we witnessed class sizes of up to one hundred and fifty children being squeezed into the hot, humid, airless classrooms which must become totally unbearable when the temperature reaches the maximum 40 degrees centigrade outside. School design is just one of the many undesirable legacies that the British have left in Uganda; the Pearl of Africa. What is truly remarkable is the contrast between the colonial “barracks block” school buildings and the beautiful, indigenous homes; composed of clusters of simple, circular huts that appear to grow up out of the landscape; in a similar way to the termite mounds that also share the land. These homes are made from freely available local materials and use techniques that have been passed down through countless generations. However, there is far more to the design of these buildings than that! They are brilliant examples of bio-climatic architectural design, where every element has been carefully refined to create a comfortable, well-tempered environment inside with no energy inputs! The heavy mud walls stay cool and reduce the internal temperature. To stop them being heated up by the sun they are shaded by deeply overhanging roofs which also protect the mud walls from the torrential rains that occur twice a year. They are topped by perfectly formed conical roofs, made from thin, flexible, round wood saplings, lashed together with palm fibre ribbons. The thatch covering this lean and structurally efficient frame, which is light enough to be lifted into place in one piece, forms a deep mat of plant fibres that prevents rain entering the interior. This deep roof covering contains pockets of air that provide insulation, preventing the heat from the equatorial sun entering the interior; working in combination with the thermally massive walls to maintain a comfortable, well-tempered environment! Inside these perfectly formed, highly sustainable dwellings the furniture is also made from the earth; with stools, tables, beds and shelving units all exquisitely crafted from mud and adding to the total thermal mass to help regulate interior temperatures. There is a seamless relationship between the fabric and furnishings that create a simple elegant domestic environment that is firm and full of delight! Even domestic appliances like stoves and grain grinders are made from mud and stone and are seamlessly integrated into the walls and floor so that everything displays its relationship with the earth from which it is made. These truly beautiful spaces reminded me of the paintings of interiors by Dutch Masters, sharing a warm, earthy darkness; providing a calming and restful counterpoint to the hot, bright, saturated colour outside. The vision for the school we are going to help the community to build is to work with the farmers to build the school themselves so that the economic opportunities created by the construction process directly benefit the local community. We want it to be as comfortable, elegant and sustainable as their homes and be able to be built and maintained by them. We want to help them create a new exemplar for Ugandan school design that other communities will want to replicate. Ultimately, we want to help them to avoid the mistakes that we have made in the so called developed world and in so doing help us to see how we can develop our own new sustainable architecture by rediscovering the lessons of our bio-climatic, vernacular. Ultimately, I believe that it is essential that we return to designing buildings which are directly shaped by their climate and made from locally available and plentiful materials if we are to meet our needs in a sustainable manner; weather that is in Uganda or Britain. To help us to realise this dream please donate to Pop-up Foundation so that we can commence the realisation of the vision! Come on IKEA; do the Right Thing! "Our vision is to create a better everyday life for the many people." "Offering a wide range of well-designed, functional home furnishing products at prices so low that as many people as possible will be able to afford them." So how can it be that a company with such a powerful and a clearly articulated vision can believe that it is acceptable for them to be responsible for the senseless destruction of a pioneering eco building after less than 15 years? I would argue that their unacceptable behaviour on the Greenwich Peninsula is driven by an obsession with cost not value and that this is distorting their decision making, leading to outdated thinking that is not relevant to the specific demands of the many people who occupy our crowded island; let alone the residents of Greenwich Peninsula who already suffer from dangerously high levels of atmospheric air pollution caused by road traffic. 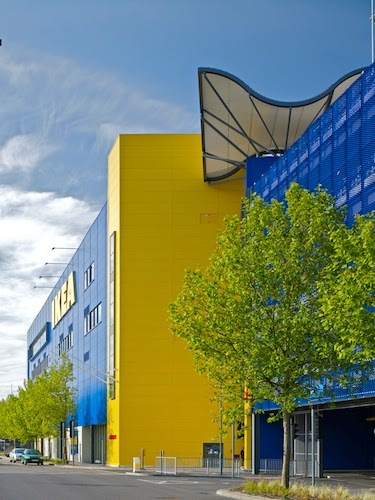 ﻿﻿Prior to the recession IKEA delivered two stores in Coventry and Southampton that sort to evolve a development model that retained their distinctive blue and yellow presence but designed a solution to work in harmony with, rather than to the detriment of their host communities, locating them in urban locations, well served by public transport and adjacent to existing retail centres. At this point I should say that we worked with IKEA on their Hillingdon and Southampton projects, so have an in-depth knowledge of both the process and the resultant development; so it is uncomfortable to say the least advising a client that what they are doing is unacceptable and in conflict with their published sustainable development objectives. We live in an increasingly resource constrained world, where there is growing concern about the availability and price of many common building materials, so to senselessly destroy a perfectly serviceable building after less than 15 years, is in my view immoral and totally unacceptable. Customers expect corporations like IKEA and Sainsbury’s to do the right thing when selecting and sourcing products, undertaking their business activities and helping their customers to minimise their impacts on the environment; but fail to see the hypocrisy that is implicit in promoting demolition. 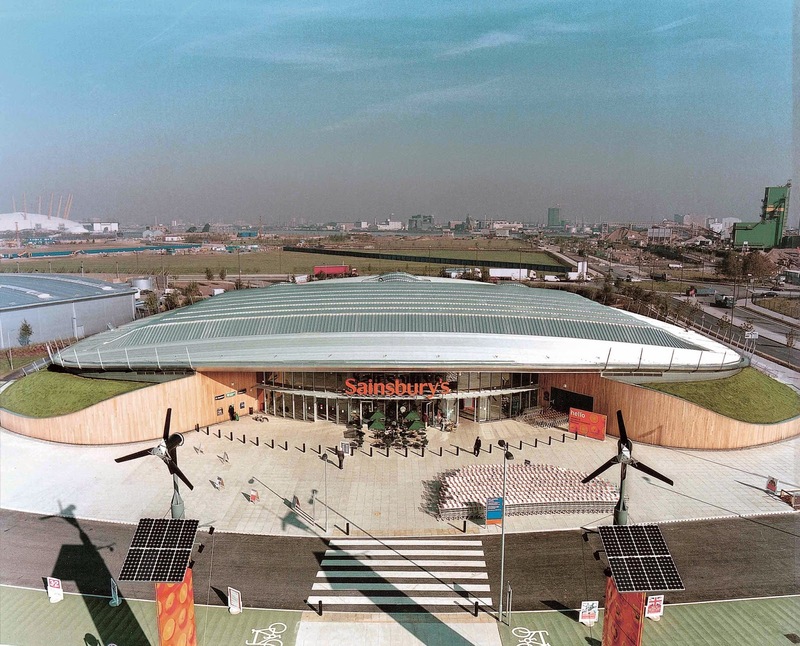 Sainsbury’s justify their position by saying that building technology has moved on since the building was completed and that their new store will use the latest technology! Does it therefore follow that they will be closing all of their branches over fifteen years old: clearly that would be ridiculous! If it were not for the restrictions that they have placed on the building preventing it being re-let to one of their competitors, it would not now be threatened with demolition. 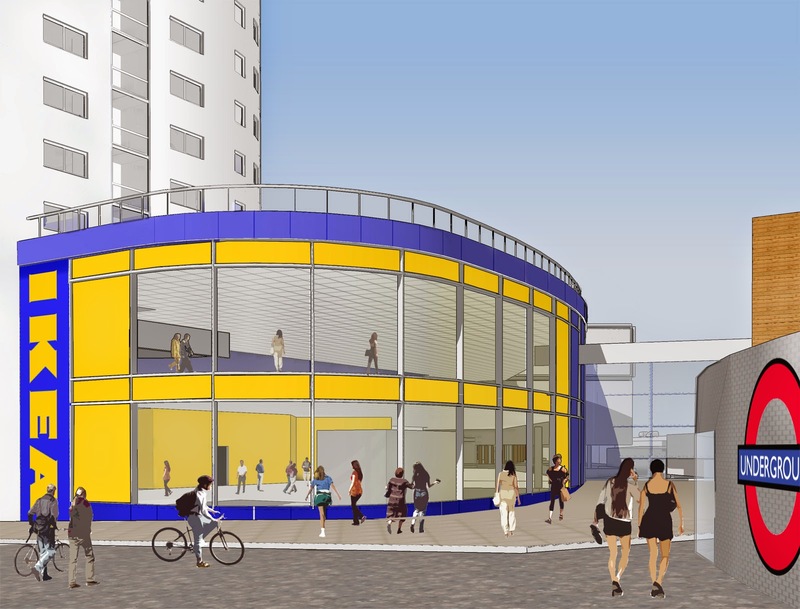 IKEA say that they intend to recycle the small portion of the demolition waste pile that they create and are also going to use a green roof on their new store. When you bear in mind that the proposed building will be over twenty meters tall I am not sure what they believe this will achieve for local residents, but the fact that they are happy to state this as some form of compensation smacks of tokenism of the worst possible kind. It still seems inconceivable to me that either IKEA or Sainsbury’s are happy to have their brands associated with an act of such wonton destruction but they appear not to care! Last weekend, local residents who started a campaign “No IKEA Greenwich Peninsula”, held a protest picnic in the eco-garden planted by the Woodland Trust behind the store. They oppose the loss of a culturally significant public building and the introduction of a large, car dependant store into the heart of their community, which already experiences some of the worst air pollution in London. I believe that many retail companies view their property activities as not really core business and are therefore able to convince themselves that different standards of behaviour apply to their property activities. IKEA would not buy up millions of pounds worth of second hand, perfectly functional home furnishing products, only to then senselessly smash it up; as this, they would rightly judge, to be unacceptable behaviour! Yet this is exactly what their property department are proposing! Come on IKEA, do the right thing, remove the threat of demolition from a pioneering eco building that is less than fifteen years old and think again. Develop a proposition that meets the needs of the many people of London by developing a store directly served by train or tube and built with the same care, craftsmanship and environmental stewardship that you demand from you furniture.